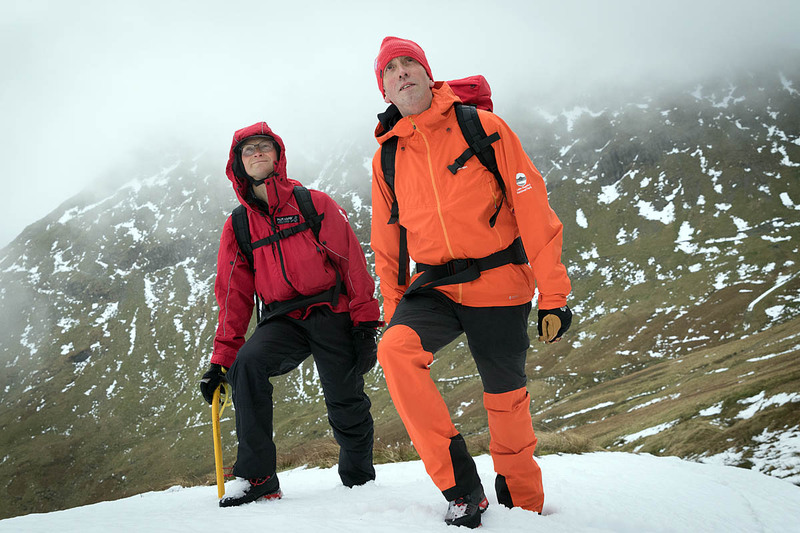 Jon Bennett is one of a pair of felltop assessors who are paid to climb Helvellyn each day during the winter to record weather and conditions underfoot for the Lake District National Park Authority’s Weatherline. While most of the country will be settling down to indulge themselves with festive fare, the Ambleside-based outdoors expert will be collecting vital safety information to help walkers and other enthusiasts heading for the hills in the national park. Grough joined the two men on the route to Helvellyn as they prepared for their winter duties. Graham works in the outdoors industry and is a member of a mountain rescue team. He holds the Winter Mountain Leader Award and the Single Pitch Award rock-climbing qualification. Jon, on the other hand, has no formal mountain qualifications but has a wealth of hill experience. When he’s not assessing mountain conditions, he works skippering and crewing boats for Windermere Lake Cruises. During the winter divides his working time between the lake and Helvellyn. He started his ninth season as a felltop assessor at the beginning of the month. Graham is undertaking his third season as a mountain assessor. This winter, he is again running winter-skills training courses and the pair are offering an additional service. He said: “We record the wind speed, temperature, windchill and wind direction so if it’s snowed, you can tell where the snow is going to be. Also we measure snow depth. 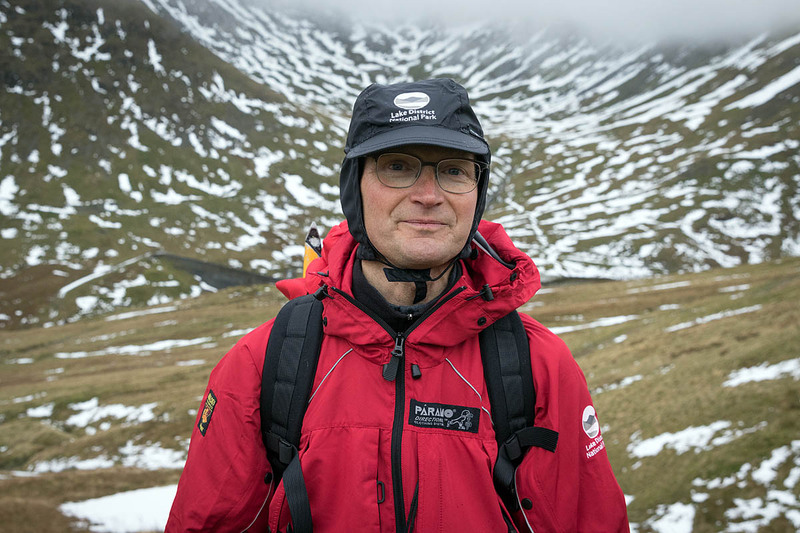 “We’re now doing the #summitsafely campaign, which is 20 bits of advice throughout the season, one a week until the end of the season, and that’s linked into prize draws and give-aways. “People can go on Twitter, use the hashtag and tell us something they have done to keep them safe in the hills that week, and they get entered into a prize draw to win prizes from one of our sponsors. Jon explained how some hillgoers who have not walked on the Cumbrian mountain in winter get into difficulties. “We get a lot of people who come up in winter who are quite simply not aware of how different conditions can be,” he said. “People come up in summer and they are unware of how different conditions are in the winter. So the tips are going to be very much telling people what to expect. “Things like my favourite tip: always be prepared to turn back. The mountain will always be there for another day. If conditions are getting too much for you; if you don’t think you’ve got the skills to progress, or the equipment, or the visibility’s not right, or whatever is not quite right, then turn back. “We see people who have set off from the car park, and all you can see around you are green fields and green hills. The snow level begins higher up and it could be obscured by cloud so you can’t see it. They set off; they’ve no ice-axe, no crampons; they’ve got fairly high up and encounter the snow and ice and they simply haven’t the right equipment to deal with those conditions. “Because they are quite high up already and the summit they can see is just around the corner, they think: ‘let’s keep going’ and that’s when it gets potentially dangerous and that’s when we often step in. To be frank, we’d do that anyway even if we weren’t working, just have a friendly word to say to people: are you aware there’s ice up there or steep snow slopes and if you slide and haven’t got an ice-axe to stop yourself falling, you’re going to get into serious difficulties. “Generally speaking, people do adhere to that advice. The last thing we are is felltop police and we’re not there to say: you haven’t got the equipment; go back down. We’re there to give people information; that’s what the whole service is about. Helvellyn was chosen as the usual destination for the two felltop assessors because of its popularity and because its headwall, above Red Tarn, holds snow and ice frequently, and the two classic ridges often used for ascent and descent are often in winter condition. Jon said: “Nearly always the exits to the ridges are where problems occur, particularly Striding Edge and Swirral Edge. 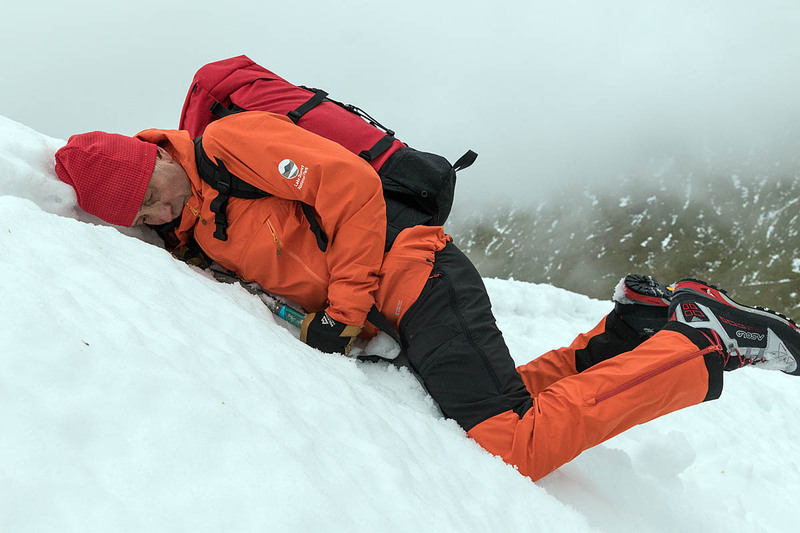 There can be steep snow banks which, particularly if they freeze over, can be hard névé and very solid snow and ice which, if you haven’t got the right equipment: crampons and ice-axe, to get down them, are very treacherous and unfortunately that’s where accidents have occurred in the past. “So that’s something we often highlight. They are both east-facing, so they hold the ice and snow a lot longer than other areas. Graham said being a felltop assessor is a dream job for him. “It’s a job that suits both Jon and me, but it wouldn’t suit most people. People imagine it’s always lovely but it’s not. Most of the time, it’s middling. We get some good days; we get some bad days; but a lot of the time it’s just grey. That wouldn’t suit everybody and also, climbing the same mountain every day wouldn’t suit most people. Jon said: “You need a memory like a goldfish. “We know Helvellyn well but in the past I’ve given people advice when they are going up without map and compass and had comments such as ‘Oh it’s all right mate, I’ve been up here five times before’ and I say: to be honest with you, I’ve been up here 450 times and I used my map and compass yesterday. As well as checking the Lake District Weatherline and the hashtag #summitsafely on Twitter, Jon recommends would-be Lakeland hillgoers learn mountain and winter skills and how to navigate safely. Details of Graham’s winter-skills courses can also be found on the Weatherline website. Love this article and the passion in both Jon and Graham. Thanks for doing your job well as it gives us the assurance of the safety if we were to climb the mountains.